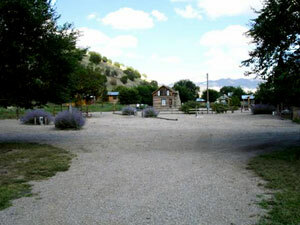 The Apache Kid RV Park is located at the west end of Chloride. It has 5 spaces, all with full hookups. Four spaces are pull-through, and can accommodate any size RV. 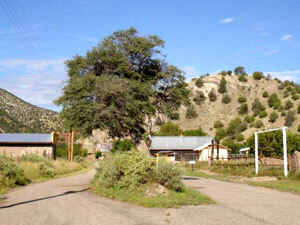 The RV Park is an ideal jumping off place to explore the vast Gila National Forest, only a short distance to the west. 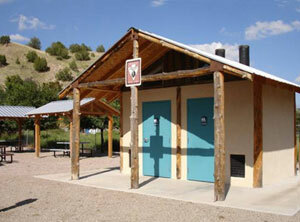 The Chloride Rest Area is at the west end of town, adjacent to the Pioneer Store Museum. It consists of two modern vault type toilets, three sheltered picnic sites, several picnic tables, and space for the kids to work off their excess energy. The old Grafton Cabin, which once graced the Down Town Mall in Las Cruces, is located in the Rest Area. The vast Gila National Forest eastern boundary lies a scant mile and a half west of Chloride. Forest Road #226 extends from Wall Street in Chloride through the Forest to the west side of the Continental Divide, and connects with NM 159. The total distance is approximately 37 miles of spectacular scenery. There are many canyons and mountains to explore, all within hiking, biking, or 4x4 vehicle range. This rather strange building was built in 1921 by Mr. Austin Crawford. Constructed of native red stone, it was built for a specific purpose: to protect its inhabitants from large hailstones which Crawford believed would one day rain down in a display of God's wrath. The roof was steeply pitched to deflect these hailstones. The building originally had four rooms, one of which has collapsed. It was built so that once inside, you could not go from room to room, but instead had to go outside to get into another room. The larger room has both an upstairs and a basement. Austin Crawford came to Chloride at its beginning. He built a small stone house in 1880 of the same native red stone he later used for his ‘special’ building. Both of these stone buildings are listed on the State List of Cultural Properties. It appears that the building was never needed for its original intent. Cassie Hobbs, a wonderfully talented resident, used the building for her workshop. It was here that she created her ‘home made’ furniture, and her fine arts. It was she who coined the name "Doodle Dum" for her building. This small building, built of native red stone, has been used for many purposes. 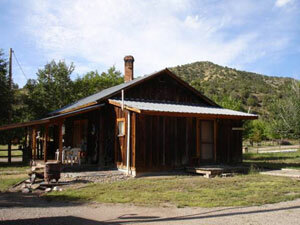 It was originally built by Mr. Woodhouse, a mining engineer, to be his chicken coop. Local lore says that the residents made fun of Woodhouse because he built such a sturdy building for his chickens, yet he himself lived in a shack. He quelled their ridicule by devising a contraption that allowed the chickens to let themselves out to free range at daylight after he had left for his job in the mines. In the evening when he returned from work, the chickens were back in on their roosts, and he had only to close the door to keep them safe till morning. The building was subsequently used as a whisky distillery, a gambling den, a school house, a house for a newly married couple, a house for a family of seven (this is a tiny building), and now after refurbishment, it is a storage building. 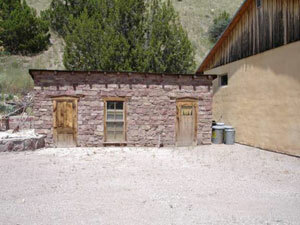 "The Judge,” as he was known, built this large adobe building in 1880 after being elected as the Justice of the Peace. The Judge was one of the men who got Chloride started. He was a prospector ‘turned city administrator.' Most of the early town records either bear his signature or refer to him. Judge Holmes was Raymond Schmidt’s maternal grandfather, and helped raise Raymond after his mother died. Since Raymond was our principle local historian, we know quite a bit about the building. It has been used for several purposes. Initially, it was the Edwin F. Holmes Law Office. In turn, it was the Post Office, a dance hall, a gambling establishment, a Harley Davidson dealership (in 1914), a Catholic Church, a dance hall (again), and used as storage for cattle feed. It was restored into a usable building in 1980 and is now a wood working shop. This building is one of only two wood frame buildings from the 1880s to survive the ravages of the elements through the years. Although the U.S. Treasury Mine is a few miles south west of Chloride, the mine officials located their Headquarters in town for the convenience of their families. The building was probably built by miners. The construction, while definitely non-standard, is in some cases very practical. The chimney is located in approximately the center of the building and is set at a 45 degree angle to the roof line. The building interior was divided into four office rooms, and the angle of the chimney allowed a stove to be located in the corner of each room with only one bend of the stove pipe to connect to the chimney. The outside walls are made of one inch thick boards installed vertically. Each board is nailed to a plate at the bottom, and a sill at the top. There is no frame. The interior walls are also only one inch board thick. The center wall is nailed to the floor, and runs all the way to the peak of the roof; the cross wall is also nailed to the floor, and runs up to the slope of the roof. The building was designed to hang on the interior walls like an umbrella, eliminating the need for 2x4 framing! This building has been restored with the exterior remaining rustic, while the interior has been made into a modern two-bedroom residence. EARLY DAYS : Chloride got its start in 1879 when the first cabin was built. A year or two before, Mr. Harry Pye was passing through the area with a mule train heading for the Warm Springs Indian Reservation. He spent the night in the canyon, camping in thick brush to help conceal his location from Victorio, an Apache Chief. While in the canyon, he picked up some ‘float,' rocks that had washed down the creek when it was in flood stage, thinking that the rocks looked promising. Pye, an Englishman, had mustered out of the Army in Arizona Territory a few years before. He had drifted into New Mexico Territory, where he had worked as a prospector, a freighter, a scout, and an Indian fighter. He eventually had his float samples assayed, and found that they were high in Chloride of Silver. Pye then had to make a decision: he could terminate the freighting contract he had with the Army and prospect for the source of the high grade ore he had picked up, or he could continue his contract and go prospecting when the contract period was over. He elected to continue with the contract, maybe because the pay was assured while prospecting was not. He kept his find a secret until the contract had expired, then he began to try to find prospectors to come with him. While in Georgetown, on the west side of the Black Range Mountains, he met two young men who were recently arrived from Kansas and were looking to get involved in the Silver activity. Most of the experienced men would not come because they were aware that this area was a favorite hunting ground of the Warm Springs Apaches, and they were killing intruders. It has been reported that Pye told the young men, Forbes and Elliot, that he knew of a secret canyon that had a ledge of silver. They agreed to accompany him to his secret canyon. They arrived in present day Chloride Canyon in late 1879. They build a log cabin for shelter, near the west end of the canyon before it boxed up. They soon located, in a rock face of a mountain, a seam containing material similar to that which Pye had found two years earlier. They began a drift into the mountain, and got in about 10 feet before Victorio and his band of warriors found them. There was a fight, and Pye was killed when his gun jammed and he could not keep the warriors away from him. The other two men held out until dark, then were able to make their way south to a mining camp near present day Hillsboro. There they told the story about the fight, and also about the ‘rich’ find Pye had told them about. That started a rush, and the records indicate that soon the entire canyon was a tent city. The area soon began to take on the appearance of stability. 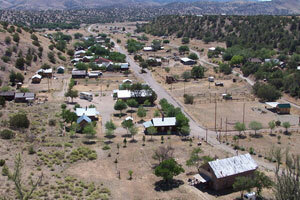 A judge from Socorro, Judge Donahue, arranged to withdraw 120 acres of ‘public domain’ for the new town site. He also arranged to withdraw a 20 acre tract about one mile west of the new town for a stamp mill site, and a 20 acre tract a mile east of town for a smelter site. The new townsite was surveyed into “lots, blocks, and parcels, all divided by streets”. The main street, called Wall Street, was made to be 60 feet wide to accommodate space for horse and wagon traffic, and leave space for a board walk on each side. Wall Street was located about the middle of the canyon, and ran east and west. Two additional streets on each side of Wall Street were surveyed, running parallel to Wall Street. These streets were 40 feet wide, and none of them ran the full length of town, because of the steep canyon sides. The Blocks were divided by side streets, and which were numbered 1st Street to 9th Street, starting at the west end of town. Each block contained 24 lots. Lots 1 through 12 fronted on Wall Street, and lots 13 through 24 fronted on one of the parallel streets. Each lot was 25 wide and 140 feet long. There were a total of 14 blocks surveyed, with 24 lots per block for a total of 336 lots. Some of the lots were located on the steep canyon walls, so were not usable as building sites, but they were in demand as a place to keep the family cow. In addition to the blocks, there were several ‘parcels’ of odd sizes at the east end of town. We have been told by our ‘Old Timers’ that the townsite was surveyed by Mr. Henry Schmidt, a young man who had recently arrived from Germany. Those same Old Timers told us that Mr. Schmidt used the Pye Cabin as a basis for laying out the town site, since there had not as yet been a formal survey of the Territory. The newly surveyed lots were distributed among the residents by lottery. Corresponding numbers for the lots were placed in a container, and were drawn in turn by the residents. Some received multiple lots. The documents uncovered so far do not show that there was a charge for the lots. One report states that city officials offered a free lot to any single woman who would agree to make the new town her home. The same report shows that a free lot would also be offered to the father of the first baby born in Chloride, with the caveat that he had to prove he was! After considerable discussion, the name Chloride was selected for the new town. An election was held to elect town officials. The records indicate that a Justice of the Peace, a Town Clerk, and a Board of Trustees were elected. Mr. Edwin Holms was elected Justice of the Peace, and he became prominent in the development of Chloride. The year 1880 saw many of the tents replaced by sturdy structures. 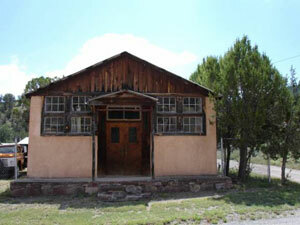 Most of the building done at this time used local materials, which consisted of adobe, rock and logs. The dirt floor of the canyon was acceptable for making adobes, and building rock was plentiful in the canyon a few hundred yards to the west. A cliff of red sand stone continually sloughed off chunks of rock that appeared to be hewn to a square shape. These could be built into a wall with out the need for further cutting. Many of the walls were laid up with no mortar or with only adobe as mortar. The logs used were harder to obtain. They were harvested from the Ponderosa Pine forests that were located several miles west of the town site, higher up toward the Continental Divide. The logs were hewn to fit together tightly, and the corners were usually a form of a dove tail joint. Many of the buildings built in 1880 are still in use, a testament to the skill of the builders. GROWTH AND BUSINESS: By June of 1881, Chloride had three general merchandise stores, three eateries, eight saloons, two butcher shops, a newsstand, a lumber yard, an assay office, a confectionery store, boarding houses, and a livery yard. The U.S. Post Office was opened in 1881, and the Pioneer Stage Line began operating between Chloride and the railroad depot at Engle. In 1882, Mr. Becket brought a newspaper, The Black Range, to Chloride. That same year, the residents planted a row of shade trees along either side of Wall Street, and constructed a rock lined ditch along both sides of the street to carry creek water to the trees. The water flow was sufficient to water the town live stock and to irrigate the housewives' gardens. As more silver prospects were developed, miners and their families continued to arrive. The residents were proud of their town, and hoped to be named as the Seat of Government in the new county. When Chloride started, there was no Sierra County. The new town was located in Socorro County, while to the south, Hillsboro, which was started about the same time, was located in Doña Ana County. Both communities hoped to be named the County Seat of a planned new county. The Territorial Legislature had been talking about creating a new county out of the southern part of Socorro County and the northern part of Doña Ana County. Chloride officials requested official Town Site status in early 1881 by signing an affidavit in front of Judge Donahue that stated that at that time there were “7 well established businesses, and more than twenty substantial houses, with an aggregate value of more than $5,000.00." The Judge asked if the townsite had been surveyed, and Justice of the Peace Edwin Holmes stated that “indeed it was, and that he carried the chain himself." Once the proper forms were completed and the required fee of $10.00 was collected, both were submitted to the Land Office in Las Cruces. By late 1882, when no response had been received, Holmes contacted the Land Office to determine the hang up. He was told that the proper forms had not been submitted. He refiled the appropriate documents in early 1883. Still he did not get a response, so he contacted the Land Office again. This time, he was told that the $10.00 registration fee had not been received. He collected another ten dollars and submitted it. In 1884, the Territorial Legislation created the new Sierra County, and named Hillsboro the County Seat. By coincidence, Chloride immediately received Town Site status - supplying evidence that governmental hanky panky existed even back then! In 1885 the following businesses were operating in Chloride: James Dalglish was operating his Pioneer Store, and was the Post Master. The Post Office was located in his store. Isaac Grey had a livery and feed barn; Edwin F. Holmes was the Notary Public; H. Patrick ran the Gem Saloon; Westerman & Company ran a General Merchandise store; J.H. Beeson ran the Bank Saloon (which was located in the newly failed Bank building); the Staley Brothers operated the City Meat Market; Mrs. L. Sorson was the town Milliner, and Mrs. William James was a dress maker and Milliner; Cash Woodhouse had the Boot and Harness shop; Martin Wegman was the druggist and had the Drug Store; Dr. Blinn was the town doctor; O.F. Ober had a Confection and Bakery store; L.J. Otto was the land surveyor; M.H. Koch was a cabinet maker: the Saucier Brothers were general contractors and freighters; H.E. Rickert had the Chloride Hotel; Parker & Son had the Blacksmith Shop; W.O. Thompson was editor of The Black Range newspaper. Mr. Gray had taken on the job of seeing that the shade trees were watered and cared for. Alice Barns was the school teacher, and Mr. Henry Schmidt was an assayer and photographer. An ore crushing plant was constructed in the canyon about a mile west of Chloride, and a smelter was built a short distance to the east. There was a tremendous amount of activity in the mountains west of Chloride. The records show that there were 480 surveyed ‘prospects.' About 42 of these made mines, and of those there were about a dozen that were highly productive. Among these highly productive mines were the U.S. Treasury; the Silver Monument; the Midnight; and the Wall Street Complex. CHLORIDE MILITIA: Renegade Indians were a problem from the start at Chloride. There are several reports of raiding parties attacking the Pioneer Store, and miners or freighters were susceptible when coming or going about their business. Miners Oscar Photenhauer and Carl Baumbach were killed while working on their mine dump just a short distance from town. In early 1884, the Territorial Government responded to the residents' request to form their own militia to protect against the attacks. Captain James Blain was appointed Commander, and allowed to enlist some volunteers. The unit was known as Company I, and was attached to a battalion commanded by Colonel Hudson. John Dalglish was appointed 1st Lieutenant, and Hugh Long was appointed 2nd Lieutenant. Altogether, 51 men volunteered for duty. They came from 7 foreign countries, and from all of the states north of Virginia. They ranged in age from 18 to 58 years old. When Indians were reported in the vicinity, the militia would stand guard on the high ground on both sides of Chloride. They also escorted travelers into and out of Chloride when requested. The residents were required to purchase 40 Sharps rifles and a supply of ammunition. 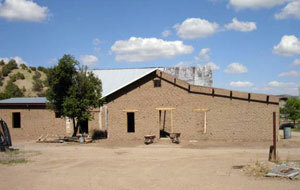 They also built a large adobe building at the west end of town to serve as an armory and barracks. Chloride's Militia Barracks and Armory, built in 1884. By 1890, the town had boomed to nearly 3000 people, mostly hard-working, hard-drinking, hard rock miners. It took nine saloons of every description to slake the thirst of these hard-living men. There was no Church in Chloride, however, and when the circuit preacher came to town, services were held in private residences. Initially, Chloride also did not have a jail. The live oak tree that still stands in the middle of Wall Street, known as the Hangin' Tree, served the purpose to some extent. We were told that if the cowboys or miners got too rowdy from too much booze, they would be dunked in the stock tank, then chained to the tree until they saw the error of their ways. The village of Fairview (now Winston) was started a few years after Chloride by the gentle folk who could not abide the rowdy element in Chloride. Chloride's Hangin' Tree, located in the middle of Wall Street, is a live oak. The State Forester believes it is well over 200 years old. Chloride had its share of shootings, and at least one hanging. The hanging was not fatal. It seems that shortly after Dr. Recee arrived in town, several prominent ladies received letters that they felt were indecent. They complained to the City Fathers, who conducted an investigation that pointed to Dr. Recee. The new doctor was threatened with Tar and Feathers and was hung in effigy from the oak tree. He was gone the next morning! DEMISE: In 1893 U.S. Governmental action caused the silver prices to plummet. 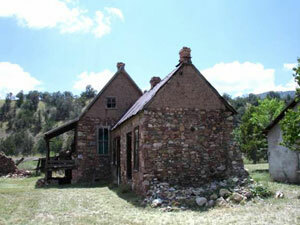 Several silver mining towns in the west ceased to exist almost immediately. Chloride hung on, but barely. Some mines closed, and several families moved on. In 1896 the final death blow was delivered. William Jennings Bryon was running for the Presidency against McKinley. Bryon was a silver advocate, and of course Chloride was rooting for him. McKinley was a gold advocate, and he campaigned that if he won, he would demonetize silver. He won, and he caused the U.S. Government to halt the purchase of silver for coinage. It is reported that silver prices dropped from $1.80 an ounce to 18 cents an ounce. Chloride died practically over night. Virtually all mining activity stopped. The stamp mill and the smelter shut down, and the workers all left to seek employment elsewhere. The only remaining activities were lumbering and cattle ranching. The Pioneer Store hung on until 1923, when it too closed for good. Chloride had decreased to a few families, and eventually became a quiet little retirement haven for those too old to work. As of this writing, at the start of 2007, there are 11 full time residents of Chloride. At the Pioneer Store Museum one can obtain a brochure that includes a sketch map of Chloride. A numbered legend contains a description of the remaining 1880s buildings found along Wall Street. The map and legend provide a self guided tour of the main street of this historic mining town. Check back often for our updated list of activities currently in progress in Chloride! The Grafton Cabin has been re-located at the north end of the Chloride Rest Area. The exterior stone work is complete, but the inside needs attention. It needs a general cleaning, and the walls need to be rechinked, before we can address what kind of displays are appropriate. We are looking for volunteers to help with these tasks. Interested? Contact us! The exterior of the old bank building, known as ‘The Bank,' has been completed, and work has started on the interior. Restoration and expansion of the old Militia Armory and Barracks is in process. The Monte Cristo Gift Shop and Gallery continues to attract visitors, many of whom are searching for that special gift for that special person. Many of the Artists take turns operating the Gift shop, so there is a good chance the creator of your special gift will be working that day. With over a dozen Artists participating, there are gift possibilities for everyone on your list. Paid for in part by Lodgers Tax.